I'm Akua Auset, a Celebrity Makeup Artist and soon-to-be naturopathic doctor specializing in holistic beauty having painted 1000s of faces and a 100+ of them are some of planet's most beautiful, powerful and talented people. I've combined my commitments and passions and introducing a new industry and category of product. 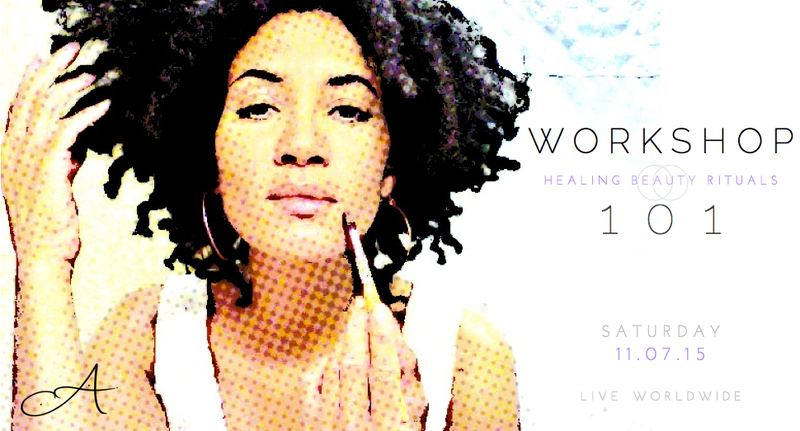 The Healing Beauty Arts combines cosmetics and alternative health care using "cosmedibles." Food that enhances your beauty and non-toxic beauty products pristine enough to eat. In less than 30 days I'm presenting my debut collection of cosmedibles to the public . . . finally. Broadcasting with LIVE participants, this XIP*-only online workshop will introduce a set of daily, weekly, quarterly practices that you can incorporate into your life that will bring a higher level of power, healing and beauty into your life. "What Is The Ultimate Beauty Mistake Of Women?" 1. Simply ENTER your answer** to the right. 3. WINNERS will be announced on Friday, 16 Oct. 2015 at 10 AM Pacific. **There could be and are several great answers to this question but I am looking for a specific answer. Provide this answer and you will be given entry into a XIP-only workshop on Saturday, 7 November 2015 at 9 AM Pacific.